Mass Meteor is a Duel minigame in Mario Party 6. Its name is a pun on "mass media". Despite its name, the floating rock obstacles are actually asteroids rather than meteors. 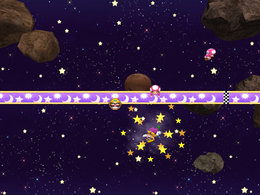 The players simply fly to the center of the screen, coming from the far left. Both players are floating in space. They appear to be trying to fly through an asteroid belt. Using the Control Stick, the player can move around the incoming asteroid. Some of the asteroids are shaped in a particular way, such as Goombas and Koopa Shells. If a player hits an asteroid, they are temporarily stunned, and the asteroid is thrown out the path. The player who gets through the checkered ring wins. The winning character stands on a platform on top of a planet and does a winning pose, while the losing player flies in the background and crashes into an asteroid and bounces away. If the minigame ends in a tie, the players will bounce off each other while flying in space. Rules – "Dodge the hurtling asteroids and float to the goal! Whoever reaches the goal first wins!" Advice – "There's no gravity in space, so watch where you float!" This page was last edited on December 28, 2018, at 19:18.